Waterford County Museum: Waterford's First Arts Centre? The Story of Dungarvan's original Town Hall. A Lecture by William Fraher. Waterford's First Arts Centre? The Story of Dungarvan's original Town Hall. A Lecture by William Fraher. The Old Provincial Bank in Bridge Street was prominently sited and was built in an imposing design of cut stone. However, it didn't start off as a bank. William Fraher has uncovered its fascinating history and why it was originally built, who designed it and those responsible for its creation. 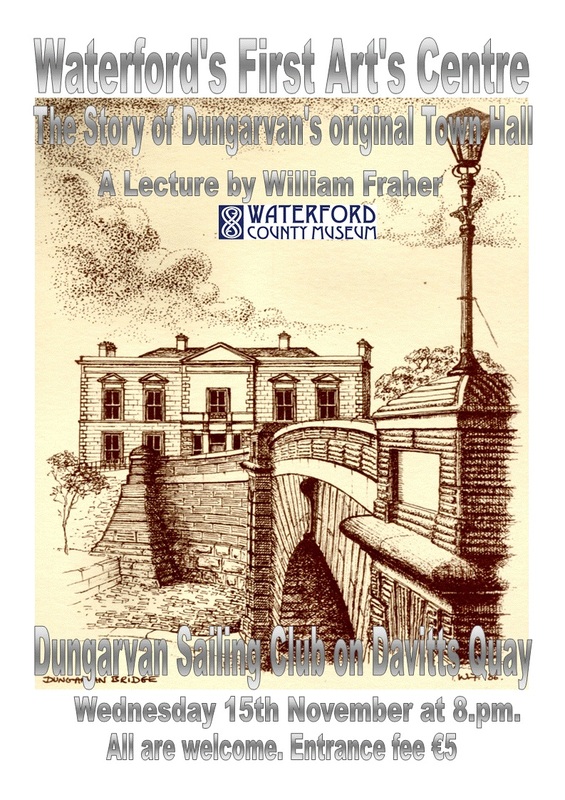 William Fraher is Dungarvan’s foremost historian. He is the Curator of Waterford County Museum Dungarvan. William has devoted his life to the History of Dungarvan and he is always the first man to see if you are seeking information about any aspect of history of Dungarvan. The drawing here is also an illustration by William. William’s talk takes place at the Dungarvan Sailing Club on Davitts Quay on Wednesday 15th November at 8pm. All are welcome. Entrance fee €5. As always this is a talk not to be missed.